All New Revised Roller Cabinet by Gerstner International - at a Fantastic Price! The Gerstner International GI-R-24 Red Oak Roller Cabinet is a beautiful wooden cabinet used to store machinist tools. The oak wood material used to make the cabinet is high quality material that helps it withstand whatever its owner puts it through. A hardwood design was used to create it so that any tools stored inside it are protected from water damage. The diversity of this cabinet provides users with both storage space and a sufficient amount of work space. The insides of the drawers are lined with green felt meant to cushion any tools stored in this cabinet. Users can be sure that the tools they keep in this cabinet will always be safe and the cabinet itself can be secured when not in use thanks to the included locking bar. Drawers are covered when the cabinet is locked, securing the drawers from opening. There are six drawers in this cabinet and each drawer can safely handle 10 pounds of weight, meaning the cabinet can hold 60 pounds of machinist tools. The drawers of this cabinet are set on ball-bearing slides that prevent the drawers from getting stuck and refusing to open. It was built like this to ensure that users can always access the tools they have stored in the cabinet. In the event the drawers need to be removed from the cabinet for any reason the process of removing them is very easy. The first step in removing these drawers is to open them as wide as possible. Users will then notice that on both sides of each drawer a small black tab is attached to the side. The tab has a notched rounded end that points to the top of one side of the drawer and the bottom of the other side of the drawer. Users must then place a finger on both notched tabs and push up the tab pointing down to the floor. While they are doing this they must also push the tab pointing down up in the direction of the ceiling. Doing so will cause the drawer to be released from the position it is locked in on the track. At that point the drawers can easily be lifted and set down somewhere else. When it comes time to put the drawers back in the cabinet the tracks on each side must be lined up correctly with the drawer. The drawer can then be pushed into the cabinet until it is completely inside it. When the drawers are put back in the cabinet they will automatically lock themselves back on the track designed to keep them in place. Machinists rely on this cabinet to help keep them and all of their tools organized and easy to find at any given time. Storage is a breeze with these cabinets, making them well worth the cost. Necessary tools and supplies will always be easy to access on this easy to move roller cabinet. Using sturdy wood it was made to withstand the test of time and big enough to hold small and large tools. 5 out of 5, Based on 7 Reviews. Very pleased. Great product for the price. Fast Shipping. very pleased with my Gertner tool chest best price on the internet,also very quickly shipped. Great cabinet. Very reasonablly priced. Very fast shipping. Great people to deal with. Highly recommended !! 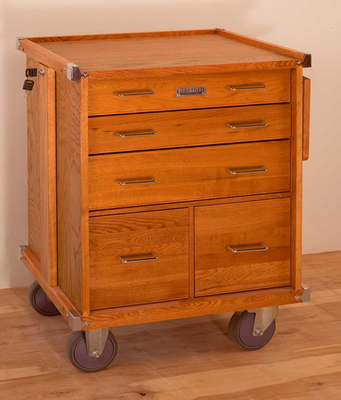 The red oak roller cabinet is a nice product of materials and construction. As for assembly... I was missing screws and a drawer handle when I received mine. After flipping the cabinet around a few times I heard the missing items cascading through the cabinet carcus. At least I didn't have to order parts. The hardest part to accept is the shipping cost, even though I got the cheapest rate through Madison Art Shop. I've been wanting this product for a long time, but the shipping rates kept scaring me away. I was hoping Sears would let me pick up an order at the store (free shipping) but they didn't offer the option. The flipable top panel wasn't as described (wood or felt). I just got a black plastic panel... black on both sides. Otherwise, I'm a satisfied customer. I'm just hoping someone in my family will realize there are matching components available before Father's Day! Excellent service, good communication. Very substantial product, just as advertised. What you would expect from Gerstner. Excellent service! Best price and the lowest shipping by far. I ordered the Gerstner cabinate on Sunday and it shipped Monday (UPS) and arrived Friday all the way from East to West Coast. I love the cabinate and will probably order the Base next. Thanks again Madison Art Shop, I'll keep you in my "favorites".